The Model T’s are long gone (of course), but the rugged route remains, meandering through some of Flagstaff’s most beautiful terrain. We had hiked the Weatherford Trail once before – in 2013 – as a substitute for the Grand Canyon Rim-to-Rim hike that we were forced to cancel because of that year’s shut-down of the federal government (and the Grand Canyon National Park). 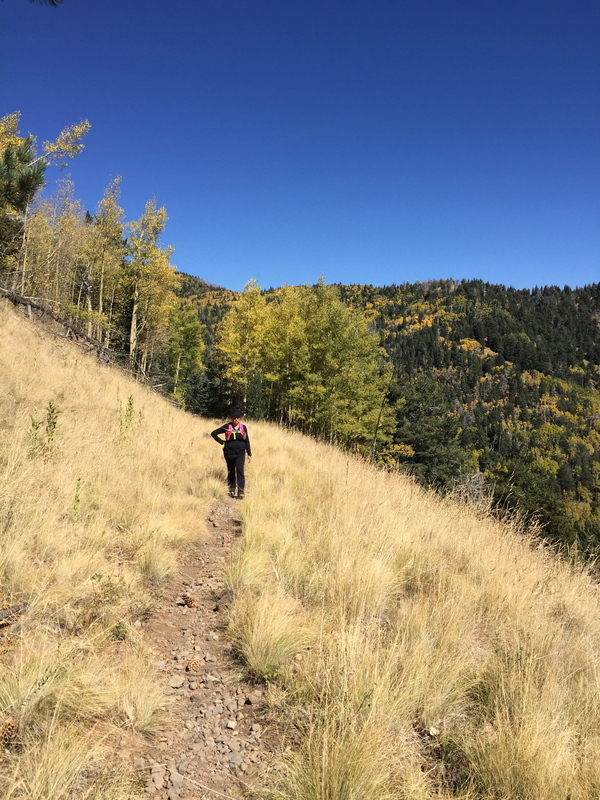 I’m not sure if it was the disappointment of being shut out of the Canyon hike that we had trained for for months, or because of the colder weather that year, but I don’t think we fully appreciated the Weatherford the first time around. That wasn’t the case this time! 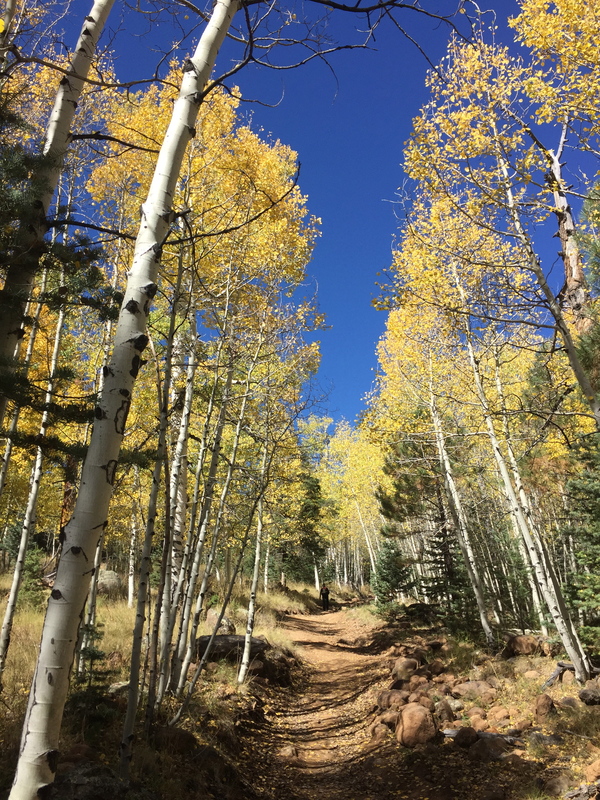 From the minute we drove into town at about 9:30 a.m. and gazed up at the towering San Francisco Peaks against the clear blue sky, we knew it was going to a great day for hiking. 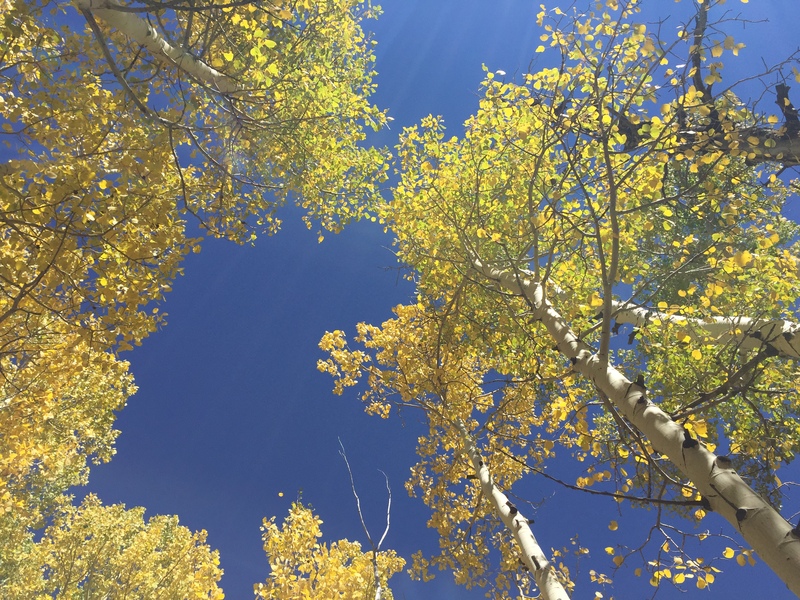 It didn’t hurt that Flagstaff was unseasonably warm – nearly 70 degrees by mid-morning. We arrived at the trailhead, via Highway 180 and then onto the dirt Forest Road 420 (Schultz Pass Road), by a little after 10 a.m., and immediately set out. 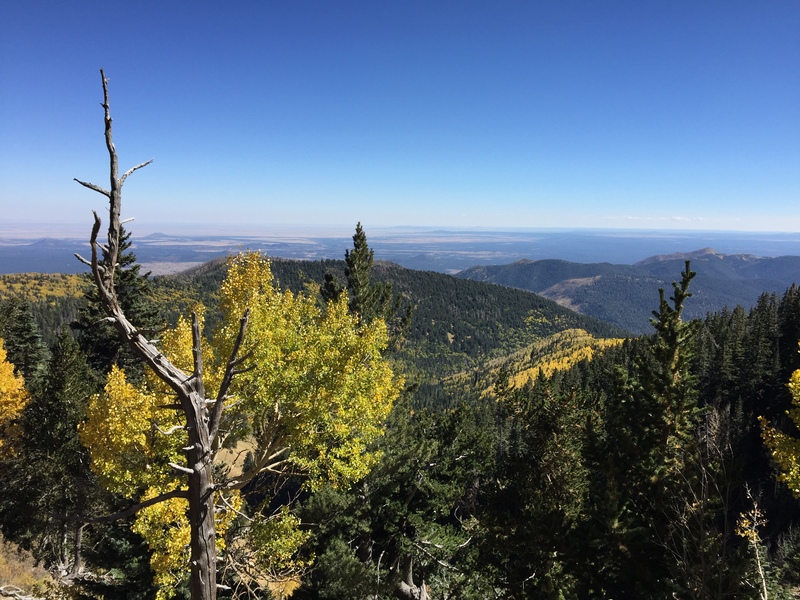 The Weatherford starts at about 8,000 feet elevation and tops out at about 11,350 – if you go all the way to the Fremont Saddle (just a mile or so from Humphreys Peak, Arizona’s highest mountain). 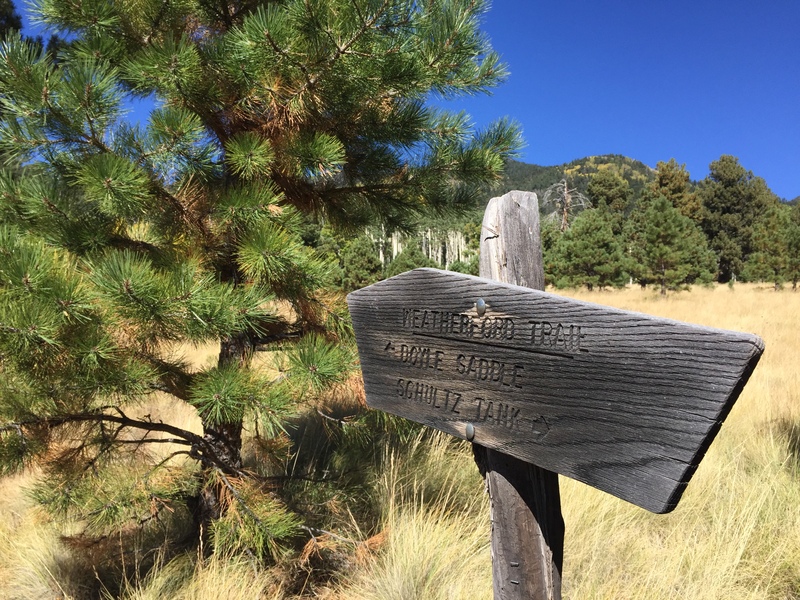 Reaching the Fremont Saddle on the Weatherford Trail would have been a 10.5-mile trek one-way. We weren’t prepared for a 21-mile total hike, so we decided to turn back at some (to be determined) point along the way. At first, we agreed the turn-back would be at the three-mile mark, then four miles, five miles, and so on. Ultimately, we went all the way to the Doyle Saddle, which turned out to be about seven miles one-way. 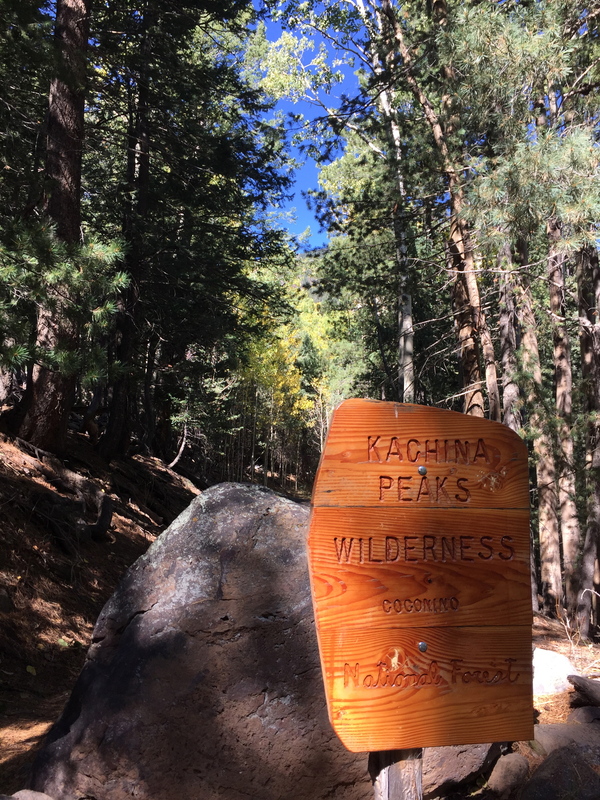 One tip – the signs along the way indicate that the Doyle Saddle is six miles from the trailhead, but it’s actually almost exactly seven. 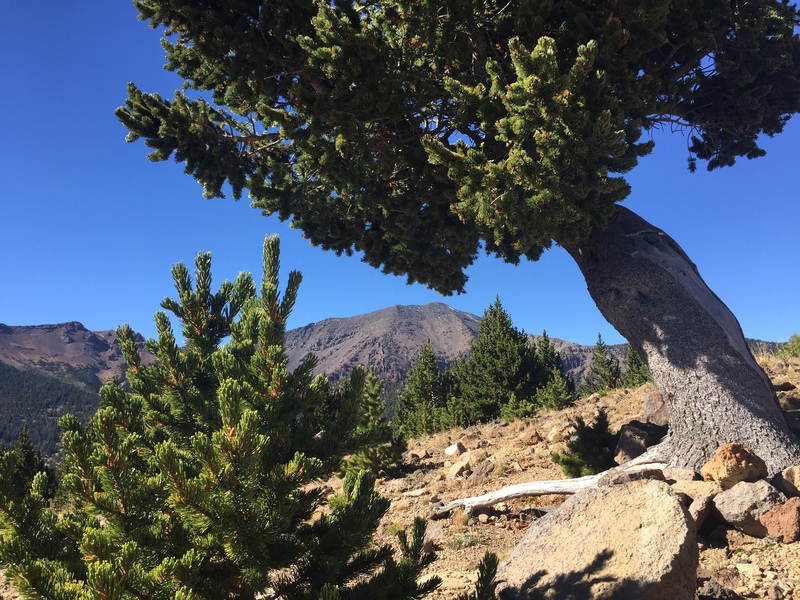 If you turn back at six miles, you’ll miss the stunning saddle, where sweeping mountain and valley views are visible in two directions. Fourteen miles was more than we bargained for, but we kept talking ourselves into going just a bit farther. 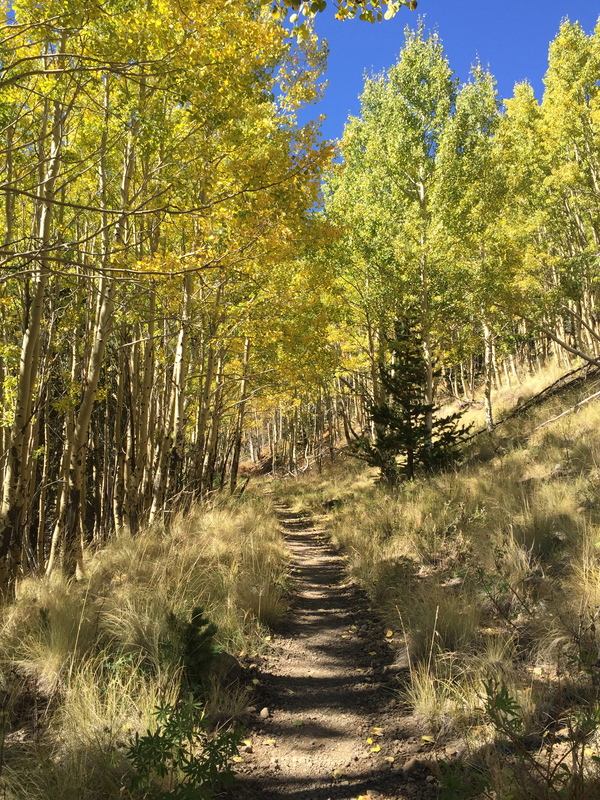 I blame it on the stands of stately aspens interspersed along the way. 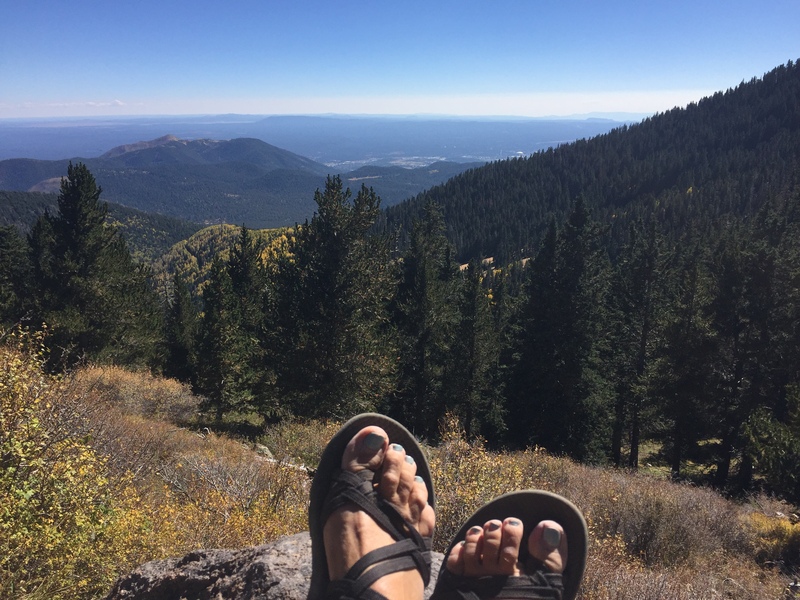 Or maybe the HUGE views of Flagstaff that opened up periodically along the way. 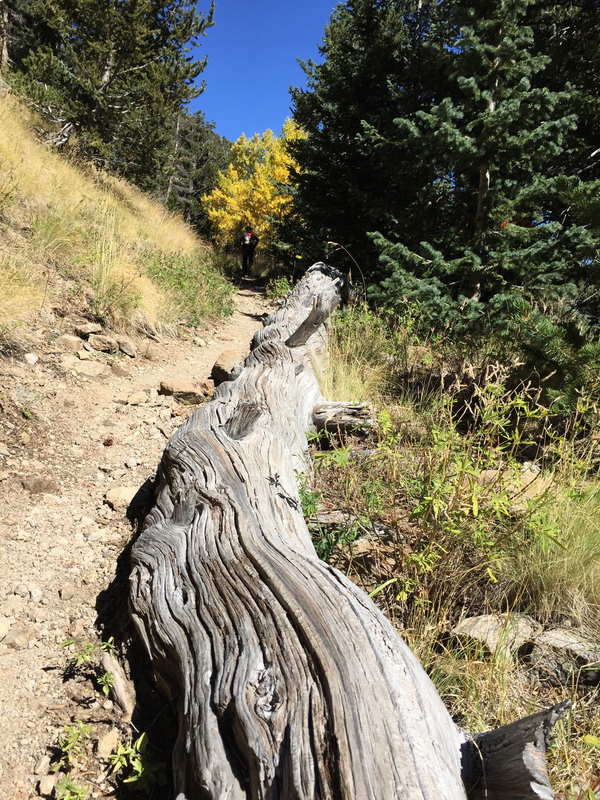 Either way, it made for a beautiful hike – albeit a long one! 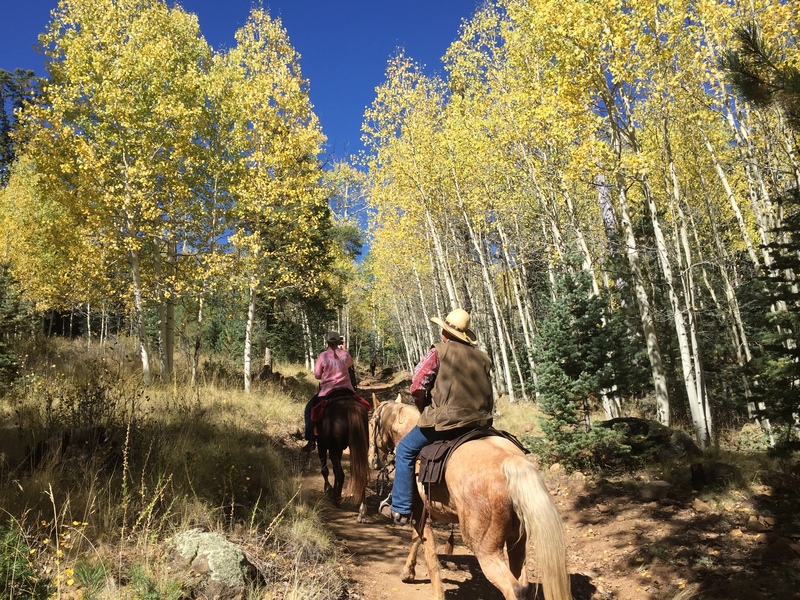 Although the trailhead parking lot had been full when we arrived, we ran into relatively few people – a few mountain bikes and horseback riders on the lower portion, and a handful of hikers at the top. And those we did meet all appeared to be as happy to be out on the trail as we were. 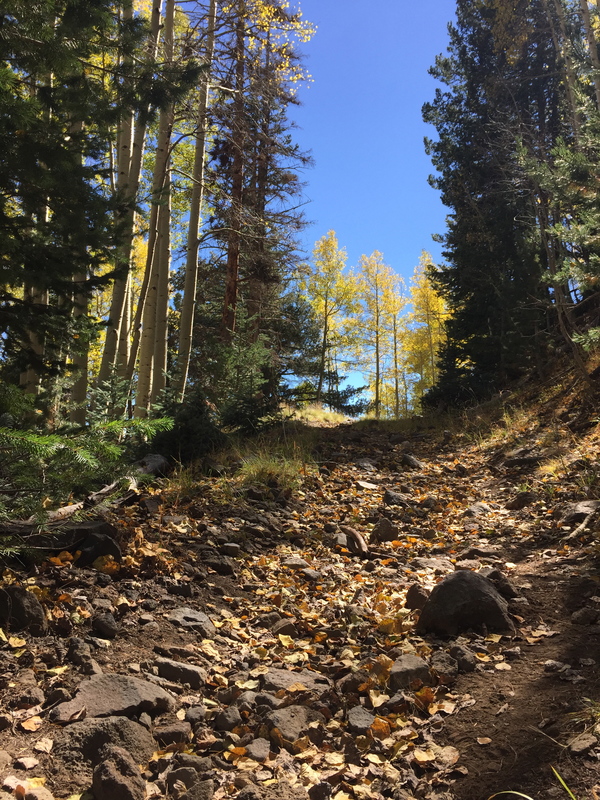 One hiker commented on the beautiful day and reminded us “it could be snowing” in Flagstaff by now. 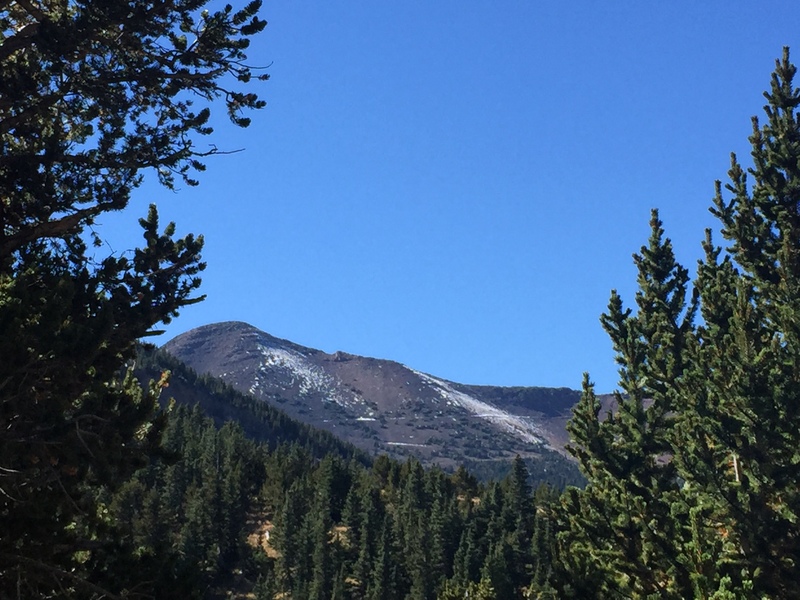 Although it was far from snowing on this warm, October day, we did spot a snow-spattered mountainside in the distance just before turning back. Reaching the Doyle Saddle involved an elevation gain of about 2,800 feet – plenty for us on that day. 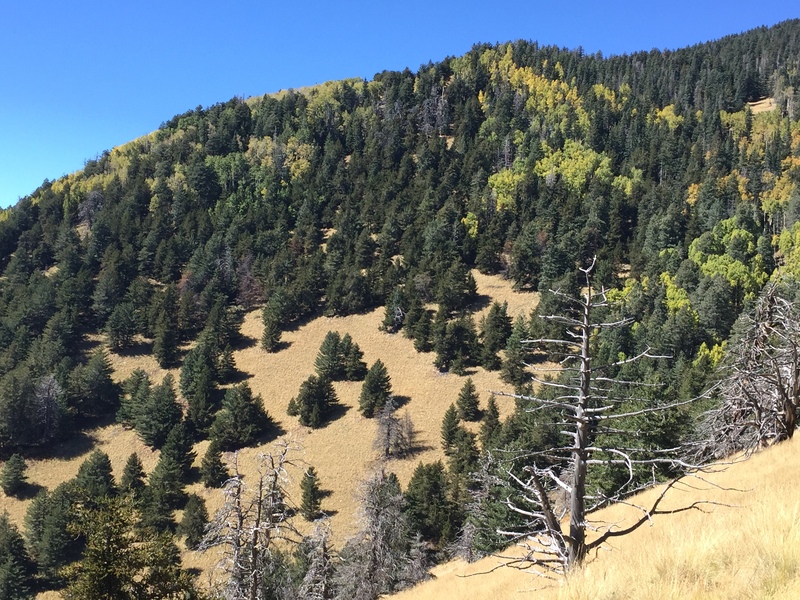 On our previous hike on the Weatherford, we had gone all the way to the Fremont Saddle, and headed down Humphreys on the steeper, shorter route to the trailhead near Flagstaff’s Arizona Snowbowl Ski Resort. 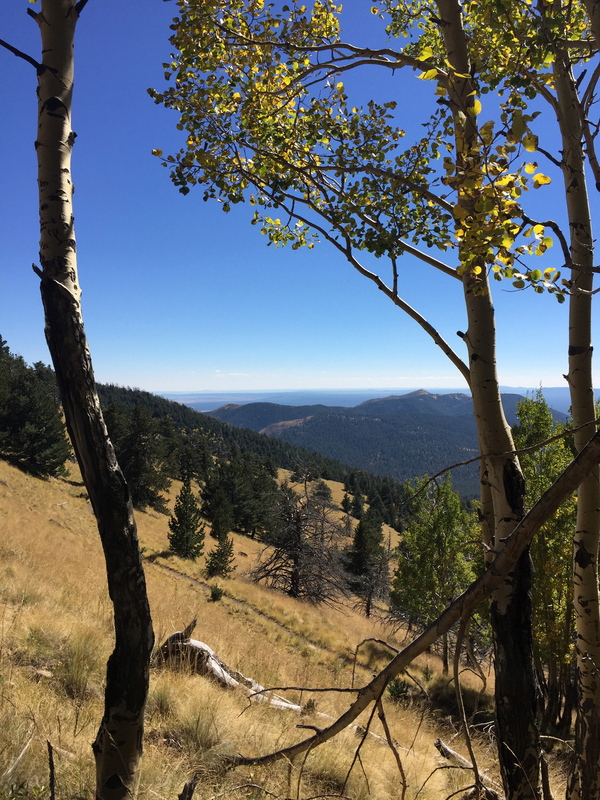 After hiking back on the Weatherford Trail on this hike, we both agreed that it was a more pleasant descent than the rock-strewn trail between Snowbowl and Humphreys Peak. Still, Weatherford wasn’t exactly easy on the way down, with plenty of rocky areas of its own. As I took in the splendor of the mountains surrounding the town over the weekend, I was happy to be reminded of Flagstaff’s pure beauty.